Running true to form this morning on Meet the Press, former Democratic Congressman from Tennessee and former Chairman of the now defunct Democratic Leadership Council (DLC) Harold Ford advocated building the Keystone XL Pipeline as a job creation mechanism in the states it will cross. David Axelrod strongly disagreed with Ford over the Keystone XL Pipeline as a job creator. Sadly, after his retirement from Congress Ford has drifted farther and farther to the right to the point that he has distanced himself from the Democratic base and the issues they support. 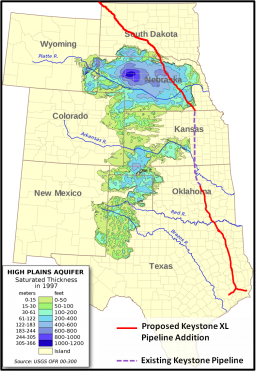 Environmentalists oppose the Keystone XL Pipeline for many sound reasons including the endangerment of the Ogallala Aquifer, one of the world’s largest aquifers that covers circa 174,000 square miles. Either Harold Ford is not familiar with environmental objections to the Keystone XL Pipeline (which seems likely) — or he is simply insensitive to environmental concerns. From any perspective, Ford has moved far away from mainstream Democratic positions on major issues. Why Ford is still a Democratic spokesman on major media remains a mystery.